Certainly a catfish for life, not just for Christmas! 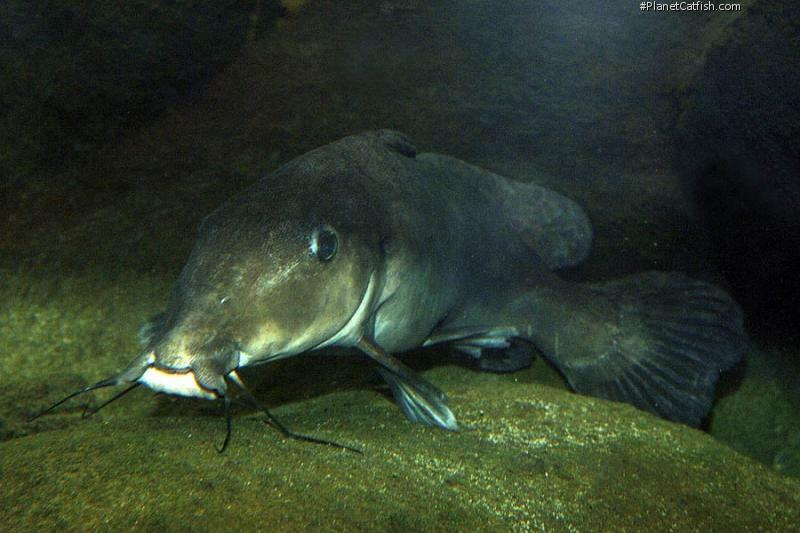 This months featured catfish are adorable as juveniles, but their real character comes with age. Also with age will come a few tank upgrades as this fish is a big one. The main drawback with a catfish of this size is its destructive capability within the confines of an aquarium. Think elephant in a greenhouse. Even when young this fish will innocently uproot plants not secured by way of plastic pots. Once past the foot long stage it will dig up the pots too in the continual search for food. Catfish, as a whole, are often considered (in unenlightened aquatic circles) as "scavengers", the diet of which doesn't require consideration as they will eat whatever is left lying around. While as a general rule this is a great falsehood, with this fish it is actually 100% true. This fish will eat anything in or around the substrate and will soon learn and react to the feeding regime. It will eat in quantity too, so a powerful filter (or filters) is a requirement for success with these fish as they grow. The fish takes it's common name from the attractive pattern it exhibits most clearly as a youngster (pictured below). Sadly with age this distinctive appearance fades a little into two-tone mottled brown. This cosmetic failing is tempered by the fishes gregarious nature. The giraffe catfish is found throughout-out Tropical Africa and has successfully established itself in many different habitats. As different, for example, as strong rivers and deep lakes. In the aquarium this adaptability manifests itself as a fish that can thrive in a wide range of water conditions; particularly in relation to pH. As with many of the larger catfish in their natural habitat, this fish is an important part of the locals diet and a large freshly caught full-grown Giraffe Catfish will grace many an African dinner table. Etymology Auchenoglanis: From the Greek, auchenos, meaning neck and glanis, meaning catfish; in reference to the long cranial shield. Size 800mm or 31.5" SL. Find near, nearer or same sized spp. The adult body is uniformly dark brown on the sides of the body and dorsally and light brown ventrally. Juveniles are heavily spotted. The fins of adults are mostly dark but may have vague mottling. The maxillary barbels are very dark but the mandibular barbels are less dark but not white. The sides and top of the head are brown and without spots. The lower side of the head is white or light brown. the upper lip is dark but the lower lip is less pigmented. The anterior edge of the adipose fin rises gradually to its maximum height at the posterior end of the fin, well behind the mid-point of the fin. General Remarks There is a good chance the size potential of the different species of Auchenoglanis may be much bigger than what is shown on the data pages. Some of the current data comes from studies which do not always use fully grown adult fish, sizes will be adjusted as proof of larger adult sizes are revealed. Distribution Restricted to the Senegal, Casamange, and Gambia River Basins of Western Africa. Feeding This species will grow very quickly on a diet of live or frozen foods, but prepared foods are equally popular and easier on the budget. Furniture In nature this fish is found living in both lakes and rivers, so the only real requirement is not too much bright light. Plants, although not eaten, will be uprooted in the search for food. Compatibility Downright sociable and safe with any fish larger than its relatively small mouth. Suggested Tankmates Ideally other medium to large sized African species (Distochodus springs to mind), this fish will also thrive in African Rift Lake Tanks, particularly the smaller Tanganyikan and Victorian cichlids. How about a large shoal of 30 Congo Tetras and one of these? For the non-purists, will do well with most appropriately sized tropical fish from any continent. Breeding Unknown - would require a very large aquarium. References Hist. Nat. Poiss.v. 15 - pp203. Retzer, ME, 2010. Taxonomy of Auchenoglanis Günther 1865 (Siluriformes: Auchenoglanididae). Zootaxa 2655: 25–5..